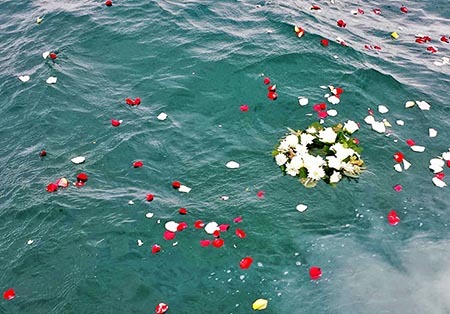 San Diego Burial at Sea began as the effort to help a colleague at work. I had a small sailboat at the time my colleague’s cousins has passed and he wanted to do a burial at sea. This was the first scattering which we did, sometime around the year 2000. There were only 6 of us on the boat and it was just a lovely day with the sun shining. As we placed the cremains and flowers into the water they made a beautiful line while carried away in the current. Looking back in to San Diego bay you could see downtown San Diego and then Hotel Del in the distance. It was a beautiful way to say goodbye to his cousin. From this beginning, we gradually expanded adding addition services, additional options and additional yachts. It has always been our goal to provide superior service to our families and the make their difficult day as special as we can for them. For the next few years we did a few scatterings per year but in 2007 decided to get more serious about ash scattering as a business and purchased a large luxury power yacht which provided a much more comfortable environment for our families. We were able have leather sofa’s in the sun-room which provides great comfort and a wonderful view. A couple years later (around 2009) we began offering our services to larger family groups (up to 48 people) at one time. For this we use special United States Coast Guard inspected vessels which are able to accommodate larger groups allowing the entire extended family to participate in the ash scattering. Currently, we can accommodate of over 120 people on a single yacht and offer charters on a couple dozen yachts in the San Diego. As well, we have yachts in various cities such as Newport Beach, Dana Point and Los Angeles. In late 2013, we wanted to greatly expand the ash scattering business in a new direction. Since we had developed a business of scattering ashes (cremains) we decided to assist families with the cremation when a family member passed, so we opened a funeral home. This was a big step and a huge learning curve. We decided to become licensed as funeral directors and opened an independent funeral home which we call “Funerals Your Way“. It has worked out very well and families appreciate only the one point of contact for all their funeral and scattering needs. We work closely with many hospices both for at-need as well as pre-planning of funeral services.